Thus far in our visit to Kamigawa we’ve seen vengeful spirits and the fighting monks of Master Kumano in the Sokenzan Mountains. Today we’ll be turning our attention to that group without which no accounting would be complete: the samurai. Of all the tropes familiar to Western audiences hailing from feudal Japan, the Samurai is likely the second-most familiar (the first being the ninja, who won’t make an appearance until we return to cover Betrayers of Kamigawa). Although we tend to conflate our notions of the military aristocracy with the code of bushidō they lived by- much as the knights of medieval Europe gave at least some passing service to the code of chivalry- the term bushidō (“way of the warrior”) itself is generally considered to be a more modern (17th century) convention. There is no mistaking, however, that this code of the samurai life had been in existence for centuries, studied, refined, and passed on by each successive generation. In Champions of Kamigawa there is certainly no shortage of Samurai, generally in the more martial colours of White and Red (though we see occurrences of Black and Green). It’s important to note the difference between “samurai” the creature and Samurai the creature type- the latter is a fairly broad category that covers even creatures designated as ronin (or masterless samurai). To set these Samurai apart, the set introduces a new combat mechanic in the form of bushido. Designed to reflect the superior fighting skills and ability of the samurai to rise to new heights of fighting prowess in the heat of battle, bushido gives any creature possessing it a +1/+1 bonus for each point of bushido they possess whenever they are blocked or become blocked by a creature. Against players (and planeswalkers), they damage as normal. Indeed, Samurai are central to the story of Kamigawa, a set which makes a very intriguing break away from our preconcieved notions about colour and morality. Without giving too much away for those who may enjoy reading the books, there is a certain reversal of expectation with a White villain and Black hero. That isn’t to say that the samurai of Kamigawa are evil, but it should be noted that loyalty was their primary virtue. This brings us to today’s deck. Way of the Warrior is a mono-White weenie deck that is both tribally as well as mechanically cohesive and synergistic. 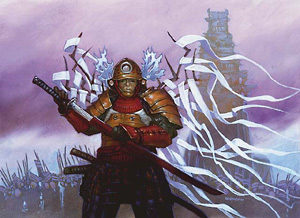 It leans heavily on the bushido combat mechanic, and is worth noting that the only non-Samurai creature in the deck is a flip card which becomes a Samurai once he’s activated. Way of the Warrior is straightforward and to the point, showing little in the way of subterfuge. It couples a steady stream of bushido creatures out of the gates almost immediately, looking to keep pressure on its opponent and win through speed and superior force in the red zone. For instance, the deck opens with a full playset of Devoted Retainers. Ordinarily 1/1’s for one mana don’t have a lot to offer at common, but the Retainer’s bushido ensures that if your opponent is going to trade for the Retainer, it won’t be with another 1/1. You also have a Bushi Tenderfoot, a 1/1 with a very intriguing ability. Should it manage to kill another creature, it flips to become the much more powerful Kenzo the Hardhearted, a 3/4 double striker with bushido 2. Without assistance, flipping the Tenderfoot would be an almost impossible task- there aren’t a lot of 0/1 creatures to be found here- but as you’ll see there are a few ways to pump him up to make sure he survives an engagement and lives to become a legend. Showing the consistency that the pre-Intro Pack Theme Decks were blessed with, your two-drop slot is filled with a trio of Konda’s Hatamotos. These “bannermen of Konda” are simple 1/2’s, but should they find themselves in the presence of a legendary Samurai (such as the aforementioned Kenzo or one of the deck’s other two), they snap to attention and become 2/4’s with vigilance. The three-drop slot is similarly consistent, being made up exclusively of a quartet of Kitsune Blademasters. These 2/2 Fox-folk have first strike, and will be a high hurdle to cross on account of their bushido for many of their contemporaries. Another playset appears in the four-drop slot with the Mothrider Samurai, a relatively simple 2/2 flier with bushido 1. Here we find also our next legendary personality, Nagao, Bound by Honor. Nagao is a powerful and inspiring presence, one of Daimyo Konda’s most trusted warriors, and he inspires the Samurai around him to even greater heights of martial prowess. To that effect, whenever Nagao attacks, all other Samurai you control get +1/+1 until the end of the turn. A trio of six-drops provide the deck’s closers in the event you weren’t able to strike to overwhelming numerical advantage earlier in the game. Two Samurai Enforcers stand ready to defeat your opponent’s most stalwart defenders, and as a 4/4 body with bushido 2 they will be a hard threat to solve. Finally, Takeno, Samurai General is the true lord of the field, giving each other Samurai you control a bonus to their power and toughness equal to their bushido score. Takeno is no slouch himself as a 3/3 with bushido 2, but should your game go long with you having amassed a small legion of Samurai, simply dropping Takeno can sometimes be enough to win the game on its own as all your creatures are immediately pumped. Way of the Warrior has a leaner mix of creatures than you expect to find in the archetype, making room for sixteen noncreature cards by way of support. These largely fall into three distinct groups: removal, combat tricks, and creature enhancements. The removal suite is average- a full four cards- but this is made up for somewhat by the versatility of the pair of Cages of Hands the deck provides. A movable Pacifism for a single mana more, this solves the problem of locking down one threat only to see a worse one emerge. Reciprocate is a little more conditional- it can only solve a threat that’s injured you- but as we saw with the Shaman of Spiritbane exiling a threat is particularly effective at keeping the soulshifting Spirits at bay. auras with flash. Finally, you have a trio of more defensively-minded combat tricks with the damage prevention of Candles’ Glow, the colour-protection of Blessed Breath, and the blinking Otherworldly Journey which can not only save one of your Samurai from certain death, but bring it back stronger than ever. Canny players will see some offensive potential in the latter two as ways to either remove or slip past a particularly thorny defense and get in for that final bit of damage. Note also that these three are Arcane spells, and that two of them allow for splicing. It’s not enough to count on it, but some games you’ll be able to stretch the value of these cards over multiple turns. The last class of spells are the creature enhancements, and our final four cards belong here. Vigilance is as simple and obvious a card as, say, Lifelink, and for it does exactly as advertised. A little more threatening is the pair of No-Dachis, reusable equipment that grants a power bonus and first strike. Altogether Way of the Warrior might have a bit too much going on to be as effective as the White weenie strategies that continue to be popular, with a 20-16 creature/noncreature split. Still, it should provie quite formidable on the battlefield, which is precisely where we’ll next be taking it. We’ll report back in two days as to what we found. See you then! Is it wrong that the first thing I want to do is dispute Toshiro as a Black hero? He is certainly a protagonist; I would call him an anti-hero. But he is certainly not the sole protagonist of the story. Michiko is at least as important; and you’ve already reviewed ‘Truth Seekers’. Anyway, I share some of your worries about the deck, but I’m particularly interested to see how useful the splice cards turn out to be. Although i’m becoming tired of white weenie decks, this deck seem the best of the set by far, packing 3 full playsets of solid and cheap creatures, rares that synergise with the bulk of the deck and support/removal to back your creeps. I love the themes of Kamigawa, from the Japanese lore to the overabundance of Legendary creatures. I really hope they do a return to the set someday, like they did with Mirrodin, and are rumored to be doing with Ravnica. I think this set deserves it more than most, as it wasn’t particularly well-loved in its day. Agreed. I love what they were trying to accomplish here, and it would be interesting to see what they’d do differently on a return. As I said, “Scars of Kamigawa” would be awesome. Ha ha! A white weenie deck with a slight bushido twist. Simple and effective. Devoted Retainer is my second favorite one-drop of the Kamigawa standards, between him and Isamaru(#1) white became a powerhouse in my local meta during the kamigawa standards. Headliner Takeno is a great tribal lord whose mere presence on the field often wins games, which I feel is a great mix of flavor vs power. I would’ve liked to see another Bushi Tenderfoot in here, perhaps trading out a hatamono. There’s certainly enough combat tricks to support it. Konda himself instead of Hold the Line would’ve been nice from a flavor perspective, but between the indestructible and Takeno’s buff for bushido-users, I can see why he would be skipped. Only gripe about this deck is the small removal. So what are the titles of the books for Kamigawa? Are they any better than the most recently published books with Nissa Revane and Liliana. In my opinion, those were terrible. But, then again, maybe I’m too used to quality authors like Jim Butcher and Robert Jordan. “Robert B. Wintermute” is a four-letter word. I told you so! I think I remember when you were asking about those books. Ugh, I could only make it through the first one and even that was painful. I just stopped and gave up in the middle of the chapter in the second one. I forced myself through the ZEN one, but I don’t think I hate myself enough to brave the SOM one. and are written by Scott McGough. They aren’t exactly great literature, but as far as the fantasy genre goes, they’re entertaining enough, and a huge jump in quality from the Mirrodin series or the post-Mending books. Do they add perspective to the Magic world? I found that the original novels surrounding Urza did an amazing job of telling a story and describing things that are only briefly mentioned on many popular cards. The new ones did nothing of the sort. How do these fare? I personally found the story engaging, since things actually happen other than the characters wandering from place to place, especially in the last book of the trilogy. However the narrative is very clearly the author’s focus – if you’re expecting more detail about the world writ large, you’ll probably be disappointed. There are many characters and plot elements in the story that don’t appear on the cards at all, some legendary characters on the cards show up once and then are never mentioned again, and most of the chapters are from either Toshi’s or Princess Michiko’s perspective. I have not read any of the novels featuring Urza, so I cannot offer a comparison there. I enjoyed the Kamigawa novels. I wouldn’t say they’re the cream of the crop, but I’d rate them above average, certainly better than the Onslaught and Mirrodin cycles that preceded them. I thought Toshi Umezawa was a pretty entertaining protagonist. If you’re interested in Kamigawa, you should check out the online “Legend Vignettes”, short stories about various legendary creatures from the block that were published on the Wizards website around the time of its release. The full list can be found at http://www.wizards.com/Magic/TCG/Article.aspx?x=magic/kamigawa/vignettes. Looks pretty good. Orignally, I was never a fan of Bushido. I read it wrong initially and never bothered to check, thinking it was whenever it dealt attacked or blocked. Now that I have reread it, I see it as a much better mechanic that is extremely flavorful. This deck has an intresting array of combat tricks, a really nice mana curve, good creatures, and more of Kamigawa’s plentiful flavor. It will be intresting to see how it does against the other decks. I agree with those who have been rethinking Bushido…in the right deck, it seems interesting and effective. Can’t wait to see how it matches up. White Weenie… Never been a huge fan. I am a combo person myself, so precons do not really focus on that too much. It does have a great curve though. It should do well in the dual. Wescoe probably likes it though. Craig Wescoe, Pro Player who was at the centre of a scandal a year or so ago. Cost him his gig writing for SCG I believe, so now he’s over at TCGPlayer. One of the best-known white weenie players. Just recently, he played a white weenie deck (splashing blue for Mana Leak and Geist of Saint Traft) to a Top 8 finish at Worlds this year, losing to Conley Woods in the quarterfinals. A while back, he was involved in a somewhat infamous incident. After he’d lost the match, his opponent mentioned betting on its outcome, so Wescoe called a judge and the player was DQ’d. This spawned a meme in the Magic community: any time you discuss gambling or betting, you “Wescoe Check” to make sure Craig Wescoe isn’t listening. “Conflate”. There you have it, you’ve just taught this non-native here a new word! Anyways, the Kamigawa block is the last one I had been aware of until I came back to playing Magic last year. My playing buddies gave up on the game after the Oddysey block; to us, it felt weird and disjointed after the more-or-less cohesive structure of the whole Weatherlight saga. Then came the Mirrodin block and the new card frames, at which point we stopped collecting cards – from the perspective it may have been just a minor tweak, but I guess that we somehow felt that our old sets became outdated or invalid. And then came the Kamigawa block. I remember it just as it was yesterday – a friend of mine had seen the new set and told us “well, they are clearly out of ideas. They have gone with the Japanese flavour, with samurais, ninjas, fox-spirits and all, there are some weird flip-cards… oh, and every other creature is now a legend.” We had little awareness of concepts such as block themes and mechanics back then, and after the Weatherlight cycle we were afraid that for the next few years we would be stuck with a setting that didn’t appeal to us all that much. So, we waved our old hobby goodbye, and the Kamigawa block became engraved in my memory as that one straw that broke the camel’s back. You have no idea how enjoyable it is to see it from a different perspective! …and come to think of it, back then we perceived block mechanics as “failed mechanics”. You had evergreens such as flying, vigilance or reach (although not keyworded yet), and then you had all those “buybacks”, “shadows” and “bushidos” which obviously never caught on – we imagined – since they were nowhere to be found after a single block. Which just goes to show you that the more you know about the game, the more you can enjoy it! On a finishing note, I have recently reintroduced my old playing buddies to Magic and they are quite taken with its new form. It’s funny to see how the once-jaded teenagers who perceived every innovation as a threat to the “true” Magic are now excited twenty-somethings looking at living weapons or morbid and going “come on, how cool is that!” You can pat yourself on on the back, because if it weren’t for this blog, that would probably never happen. 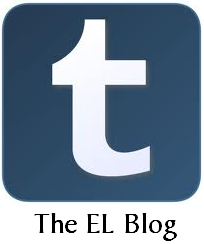 I’m annoying myself by how much I’ve been commenting these days, BUT Ertai’s Lament is my favorite blog. And for the exact same reason that you mention. It got me back into a game I hadn’t played in over a decade. It would have been too foreign and overwhelming without a way to introduce me to history and mechanics otherwise. I come back every other day for more. Or each day when I’m lucky! This deck seems to be one hell of a weenie deck. It uses a lot of the underpowered creatures, but the fact that they’ve got bushido can completely ruin attempts to block them. 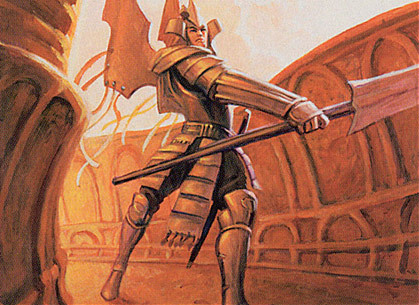 I really wanted to build a Takeno Commander deck, because the impact he has on the board is simply earth-shattering. However, there just aren’t enough white samurai. All in all, the deck looks decent and I look forward to seeing how it plays. yes, takeno is handicapped by the low number of samurai overall. He works beautifully when splashed into a sensei-golden tail led EDH though.